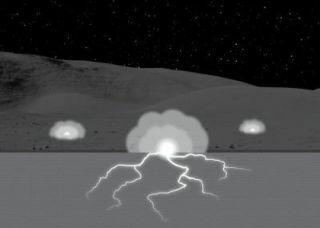 This diagram depicts a permanently shadowed region of the moon experiencing subsurface sparking ("lightning bolts"), which causes vaporized material to eject ("clouds") from the surface. Image not to scale. Electric sparks might have helped break down lunar dirt, suggesting the moon may be significantly more active than previously thought, a new study finds. This kind of sparking might take place throughout the solar system, from Mercury to the satellites of Jupiter and Saturn, researchers added. The moon is also constantly hit by high-energy electrically charged particles. For instance, electrons and protons often burst from the sun, and more energetic particles known as cosmic rays also regularly strike from elsewhere in the Milky Way galaxy. Previous studies only investigated how these high-energy particles electrically charge the uppermost layer of the lunar surface. Lead study author Andrew Jordan, a space physicist at the University of New Hampshire, and his colleagues explored whether high-energy electrically charged particles might also penetrate deeper into the moon. Lunar soil is an electrical insulator, meaning it has extremely low conductivity. Any electrically charged particles that do penetrate deep into it can thus get trapped inside and accumulate. For decades, scientists have known this phenomenon, known as deep dielectric charging, can occur in spacecraft. If too much charge accumulates, the resulting electrical sparks can damage electronics. The researchers focused on craters near the lunar poles that host permanently shadowed regions. These dark areas can reach temperatures as low as minus 400 degrees Fahrenheit (minus 240 degrees Celsius). The colder lunar soil gets, the more electrically insulating it becomes. To estimate how strong electric fields can get in the permanently shadowed areas of the moon, the scientists developed a computer model using data from the Cosmic Ray Telescope for the Effects of Radiation (CRaTER) instrument aboard NASA's Lunar Reconnaissance Orbiter and from the Electron, Proton, and Alpha Monitor (EPAM) on NASA's Advanced Composition Explorer spacecraft. The computer model suggested that powerful electric fields can build up in the permanently shadowed regions of the moon, leading to sparking that vaporizes tiny channels in lunar soil. "The lunar community generally thinks that the main ongoing process of fragmenting soil grains is meteoritic impacts," Jordan told Space.com. "Our research suggests that breakdown weathering may also contribute to this fragmenting, at least within permanently shadowed regions on the moon." The Lyman Alpha Mapping Project (LAMP) instrument on the Lunar Reconnaissance Orbiter "has detected unexpectedly dark soil within many permanently shadowed regions on the moon," Jordan noted. "Some scientists think the soil appears dark because it is more porous or fluffier than soil outside those regions. This fluffy soil has been a mystery, since it requires the grains to be very small. Breakdown weathering seems to be a process that can produce such small grains. We'll have to see." The most important implication of these findings "is that permanently shadowed regions of the moon really are a special place," Jordan said. "They are so cold that they experience phenomena that warmer regions would not." In addition, "any airless body that both has such cold regions and is also bombarded by enough energetic charged particles could experience breakdown weathering," Jordan said. Intriguingly, the permanently shadowed regions of the moon are home to water ice. "As of now, we don't know whether breakdown weathering may affect ice, but we'll be looking into that," Jordan said. To confirm whether sparking happens on the moon and elsewhere, Jordan noted that "sparks give off electromagnetic radiation at many wavelengths, including visible and radio waves, so in principle they are detectable. Detecting them during a large solar energetic particle event may require a combination of ground- and space-based observations." In addition, "having shown that breakdown weathering is a possibility, we'd like to quantify better how it might affect the soil," Jordan said. "We're working to find out how much of the soil in permanently shadowed regions may have been affected and compare that to what meteorites do." The scientists detailed their findings last month in the Journal of Geophysical Research-Planets.